We're told that they plan to offer a sneak peek of two new patent-pending products during RTC Europe next week, Xinaps Accessibility Evaluator and Xinaps Fire Safety Assessor. So, what to expect in these new add-ins? Here we discuss Xinaps Accesibility Evaluator. For Xinaps Fire Safety Assessor, see this post. Every building project has accessibility requirements demanded by the client, requested by the tenants or regulated by building codes. These typically include wheelchair or other disabled access, extra corridor, ramp, door widths, multi floor or level access via larger lift and elevator dimensions, wider doors for room access, disabled toilet and shower facilities, etc. Confirming compliance with these requirements is often a lengthy and separate checklist checking activity outside the design system. An optimal functional design includes a well thought floor plan layout with the right sizing, the right adjacencies, and optimal ways of getting there. Do you know buildings where people cannot access parts of the building, although expected? Do you recognize your building model is modeled different than design debrief, with the effect that people cannot access parts of the building other than expected? Then this plugin may be a good addition to your current design process. Xinaps Accessibility Evaluator™, working as a plug-in within Autodesk Revit®, automates this task and enables it to be done quickly. As different design options are investigated it provides decision making support via immediate status checks against all the accessibility requirements. As a result optimal design decisions can be made faster, with better accuracy and underlying argumentation. It is especially relevant to architectural designers and building engineers but also useful to all the design team. scans the BIM model for accessible rooms, corridors, doors, stairs, lifts, interiors and various other objects, regarding their available free space to pass. creates indoor navigation paths to analyse various transportation routes through your BIM model. visualizes the results into instant colored 3D visualisation, room lists, and Revit floor plans. has the flexibility to define tailor-made Accessibility Profiles, based on various local standards, client debrief, and means of transport like a wheelchair, a shopping cart or a hospital bed. enables setting up distance rules, like the maximum distance between any office desk and the closest toilet or coffee machine, the maximum walking distance between the reception and a meeting room, and the walking time from entrance to airport gate. 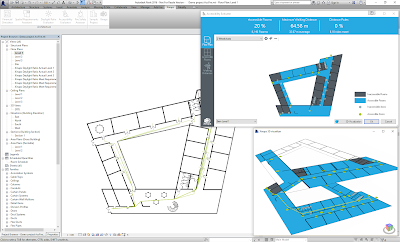 synchronizes real-time with your Revit model, which comes with units of measurement, design options, linked models, and many more. displays Accessibility Profile and Distance Rule Check results in easy-to-read performance values. Xinaps Accessibility Evaluator™ takes Revit® to a new higher performance automation level to deliver more of the promise of BIM by providing accessibility assessment and decision support for your integrated BIM design approach. There's more information available on the Xinaps website.